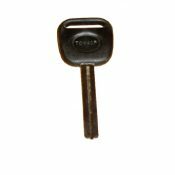 A key for Lexus cars manufactured between 1989 and 1994 cut to number or photo. Models Include: 400LS, 300ES, 250ES, 300SC, 400SC. We do not use original Lexus blanks, we use high quality steel blanks manufactured by Silca. The key number is likely to be a four digit number. Please fill in your key number below. If you do not have a number, we can copy the key if you are able to send it to us by post. An emergency key for Lexus cars, cut to fit the locks on your car. This key will suit most models from 1995 onwards. NOTE: This key does not include the transponder chip, and so will not start the engine. This will only open the locks on the car. Models include: Altezza 1995-2005, Celsior 1997-2005, ES300 1998-2006, GS300 1998-2008, GS400 1998-2008, GS430 1998-2008, GX470 2003-2006, IS200 1999-2008, IS300 2001-2008, Land Cruiser 1999-2005, LS200 1999-2008, LS400 1997-2005, LX450 1998-2005, LX470 1999-2008, RX300 1999-2006, SC300 1998-2005, SC400 1998-2008. Please fill in your key number below. 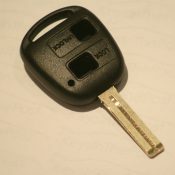 A single Lexus 2 button key remote case, with a blade cut to suit the locks on your car. This key is a plastic case only, there are no electronics included, and the key won’t start the engine. This case will allow you to swap the internal circuit board from your old key, straight into it to get your key working again. All cases are in stock and ready for dispatch. 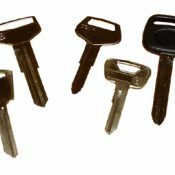 We only stock and sell high quality items, tested by our locksmiths, so rest assured you will not be sold cheap and nasty copies. We can also offer a full mail order repair service if required. This case has no logo on the reverse, it is plain. Models include: IS200, RX300, GS300, LS400.